Apache Falcon is a framework to simplify data pipeline processing and management on Hadoop clusters. This cluster is the primary cluster located in the Oregon data center. Data arrives from all the West Coast production servers. The input data feeds are often late for up to 4 hrs. The goal is to clean the raw data to remove sensitive information like credit card numbers and make it available to our marketing data science team for customer churn analysis. To simulate this scenario, we have a pig script grabbing the freely available Enron emails from the internet and feeding it into the pipeline. Now let’s stage the dataset using the commandline. Although we perform many of these file operations below using the command line, you can also do the same with the HDFS Files View in Ambari. Before creating the cluster entities, we need to create the directories on HDFS representing the two clusters that we are going to define, namely primaryCluster and backupCluster. Use hadoop fs -mkdir commands to create the directories /apps/falcon/primaryCluster and /apps/falcon/backupCluster directories on HDFS. You can also navigate to the Falcon Web UI directly on our browser. The Falcon UI is by default at port 15000. The default username is ambari-qa and the password is admin. This UI allows us to create and manage the various entities like Cluster, Feed, Process and Mirror. Each of these entities are represented by a XML file which you either directly upload or generate by filling up the various fields. You can also search for existing entities and then edit, change state, etc. Let’s first create a couple of cluster entities. To create a cluster entity click on the Cluster button on the top. Click Finish on top of the XML Preview area to save the XML. Falcon UI should have automatically parsed out the values from the XML and populated in the right fields. Once you have verified that these are the correct values press Next. Click Save to persist the entity. Similarly, we will create the backupCluster entity. Again click on Cluster button on the top to open up the form to create the cluster entity. Click Finish on top of the XML Preview area to save the XML and then the Next button to verify the values. Click Save to persist the backupCluster entity. To create a feed entity click on the Feed button on the top of the main page on the Falcon Web UI. On the Clusters page ensure you modify the validity to a time slice which is in the very near future. Now lets define the rawEmailIngestProcess. To create a process entity click on the Process button on the top of the main page on the Falcon Web UI. Again, to create a feed entity click on the Feed button on the top of the main page on the Falcon Web UI. Now lets define the cleanseEmailProcess. Again, to create a process entity click on the Process button on the top of the main page on the Falcon Web UI. Now that the feeds and processes are running, we can check the dataset being ingressed and the dataset egressed on HDFS. 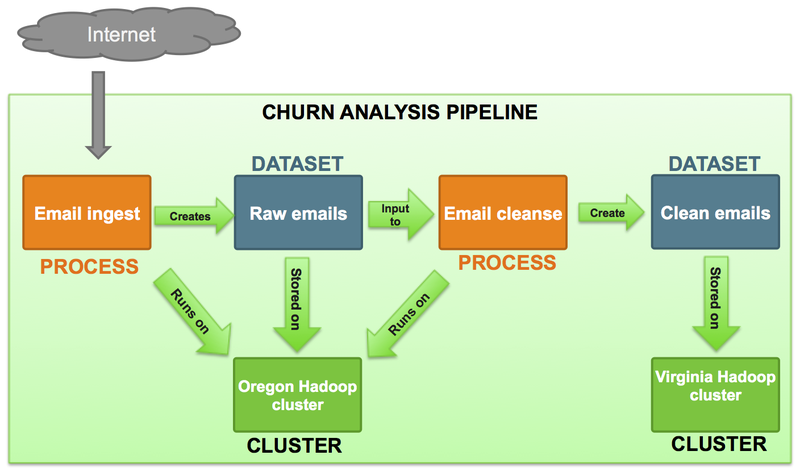 In this tutorial we walked through a scenario to clean the raw data to remove sensitive information like credit card numbers and make it available to our marketing data science team for customer churn analysis by defining a data pipeline with Apache Falcon.